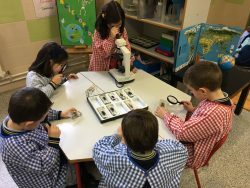 In our International Diocesan Virgen De Gracia´ School of Granada, we put at your disposal the most innovative and fundamental methods for the education of your child in his/her early childhood. The semi-open system arose as a reaction to traditional and rigid forms of teaching and learning. For this reason, we intend to offer the child an opportunity to be in direct contact with their environment, freely experiment and learn by doing based on the respect and encouragement of each child according to their specific style of learning. We are seeking an enriching educational diversity while looking for new methodologies and ways of doing. 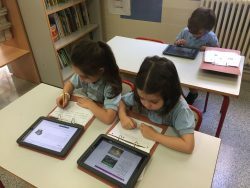 We create new resources and new techniques of relating among students themselves, teachers and the relationship with the educational community. In this Early Childhood Education School of Granada we help them to achieve your dreams. Our children will experience activities that will develop their naturalist, spatial, and kinesthetic-naturalistintelligences. Where the bodily-kinesthetic intelligence, spatial and naturalistare developed. What do we offer to our students in this Early Childhood school of Granada? It´s one of the pillars for our school and with great emphasis on the stage.Early stimulation and neuroscience form the basis of the techniques we employ. Children at this stage are at the forefront of the development in the absorbent mind. We carry out activities in which children are interacting at all times with the environment and experimenting with the diversity of materials in each area of work. We offer a practical education so that we focus our activities on the development of the skills and capacities, both deductive and inductive, of each one of the students by giving them what they need to achieve a promising future. We have the most advanced learning materials and adapt to allindividual the needs of each student. In the center, whatever the needs of the students are, we all come to similar learning objectivesregardless ofthe challenges and difficulties encountered. Because there are no incumbered children, children are not unmotivated or misguided in learning.